We started in 2007 as Hostal Refugio del Río and in May 2017 we moved to a new property in the center of Boquete and turned the former “Pension Marilos” into our new Refugio. Renovated with a lot of love put into details we created a special place for you. We offer free Wi-Fi and lockers for our guests, parking space in front of the hostel,small mini super to 3 minutes walking tour information and booking. We are located within walking distance (2 blocks) from the central square of Boquete where the public buses arrive. Also the big supermarkets of the town are not more than a 5 minutes walk away from the hostel. Furthermore, several restaurants and coffee shops are reacheable on foot from our hostel. 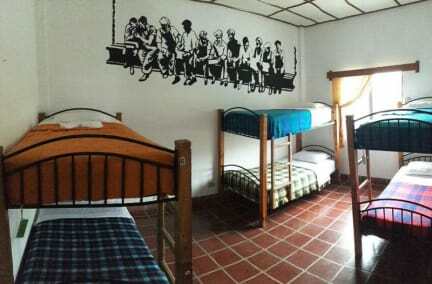 All the rooms are designed individually and are pleasant and well furnished, beds of privates as well as dorms are equipped with comfortable mattresses. The hostel is surrounded by a huge garden with hammocks: the perfect spot to relax after a long hike. The garden is designed for you to enjoy yourself during your stay. Plenty of fruit trees are growing there, In the hostel you find a huge and well equipped kitchen and a spacious common area, where you can always find someone to talk to and share stories with. The rooms are cleaned daily, the common areas even several times a day. Check in from 13:00 to 16:00 . The reception is open from 07.00 to 23.00.
it is not posible to enter this local before 11.00am . Please note that we have a cat living in our hostal. We don't know how this happened, but now she's ruling the dorm. We also have Lady Lu, the most relaxed dog ever. They are totally cool and friendly, but please take this in consideration before booking. Genial hostel. Limpio, cocina genial ,tranquilo, zonas comunes muy bien y bonito. Buen situado y buen precio. Estuvimos muy agusto lo recomendamos. 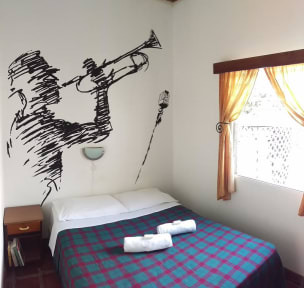 Además de que es muy lindo el hostal, tiene muy lindo parque / patio, cocina amplia, el personal es muy amable y te asesora muy bien para definir que hacer .